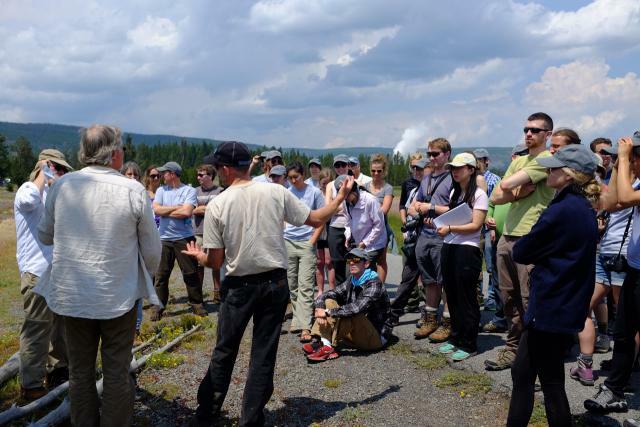 The first Deep Carbon Observatory Summer School took place from 13-18 July 2014 at Big Sky Resort, Montana, with field trips into Yellowstone National Park. 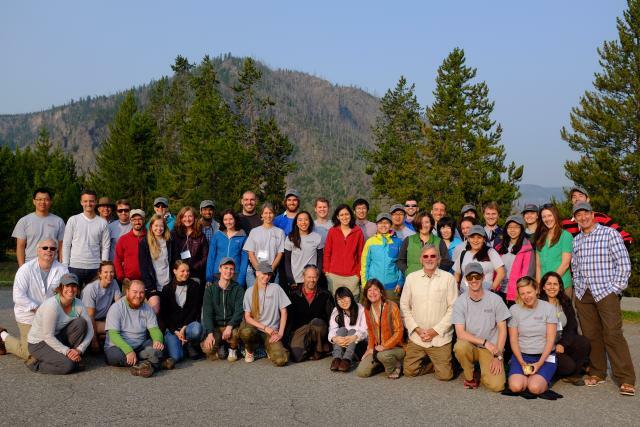 The first Deep Carbon Observatory Summer School took place from 13-18 July 2014 at Big Sky Resort, MT, USA, with field trips into Yellowstone National Park, WY, USA. Co-organized by Adrian Jones (University College London, UK), John Baross (University of Washington, USA), and Andrea Mangum (DCO Secretariat), the Summer School brought together 36 graduate students, postdocs, and early career researchers from 14 countries for a week of interactive learning and networking. The purpose of the program was to introduce participants interested in deep carbon science to the interdisciplinary concepts that are the cornerstone of DCO’s approach to understanding Earth. The curriculum reflected DCO’s broad interests and the program’s structure gave participants multiple opportunities to interact and share their respective interests in deep carbon science. 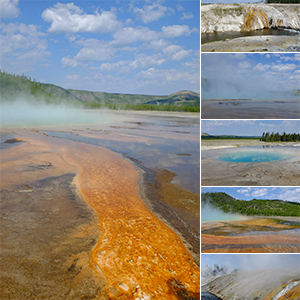 Yellowstone proved an ideal location to study deep carbon due to the volcanic degassing of deep volatiles above a mantle plume, surface and crustal fluid interactions, and extreme biological habitats. 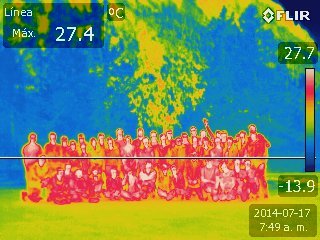 After a Sunday-evening icebreaker and dinner in the shadow of Lone Mountain, the Summer School participants and instructors gathered on Monday morning, 14 July. Co-organizer Adrian Jones opened the meeting with an overview of the big picture of deep carbon science. Taking the participants on a journey from Earth’s crust to core, he emphasized the cross-disciplinary nature of DCO, ultimately challenging the group to consider a holistic view of the program. Through volcanism, to diamond formation, to fluid dynamics, to ecosystem diversity, carbon is a common thread that links scientists of all disciplines. Next, Lisa Morgan provided background on the volcanic evolution of Yellowstone National Park, where she has worked for the past 30 years with the US Geological Survey (USGS) and the Yellowstone Volcano Observatory (YVO). For the past 17 million years, Yellowstone has seen volcanic activity, and today Yellowstone plateau is one of the most seismically active regions in western USA. Geological evidence of historical volcanism is visible throughout the park, making Yellowstone a fantastic natural teaching laboratory for the Summer School participants. Following Morgan’s talk, Pat Shanks, a USGS emeritus geochemist, described the extensive hydrothermal systems of Yellowstone. The park is home to 60 percent of the world’s geysers, which are continuously altering the geological architecture of Yellowstone and releasing a substantial amount of carbon dioxide. The morning session ended with Bill Inskeep of Montana State University, a biogeochemist with extensive expertise in Yellowstone microbiology, who opened his talk by noting the multi-disciplinary relevance of field sites within the national park to DCO scientists. After a redox chemistry refresher course, Inskeep focused his remarks on biomineralization and ecosystem diversity. Given the variations in temperature, pH, flow rate, and chemical composition of the fluids in Yellowstone, fieldwork here is crucial to understand the many ecosystems. Most of these systems would be impossible to recreate in a lab. After lunch, Peter Fox (DCO Data Science Team Leader, Rensselaer Polytechnic Institute, USA) gave an introduction to Data Science and its importance to a project as large and data-intensive as DCO. Indeed, one of DCO’s greatest legacies will be the new data available for the next generation of deep carbon scientists. As such there are important consistency, curation, and quality control factors to consider. Fox also talked about the importance of sharing data widely to advance scientific discovery, both within the deep carbon community and beyond. Sunshine Menezes (DCO Engagement Team co-Leader, University of Rhode Island’s Graduate School of Oceanography, USA) addressed the complexities of science communication within a diverse community like DCO, with scientific language varying widely between fields. She also addressed some of the concerns scientists harbor regarding talking to members of the press about their work, and described the goals of DCO’s Engagement Team to help scientists in the community engage with each other and the general public. Menezes’s talk sparked much discussion throughout the week, which peaked when unrelated news coverage on Tuesday and Wednesday incorrectly cited melting asphalt in Yellowstone as a harbinger of imminent eruption. Then it was the participants’ turn to control the day’s schedule and decide which of three breakout sessions to attend. Peter Fox offered a series of data science activities, Dave Cole (DCO Deep Energy co-Chair, Ohio State University, USA) led a 3-D visualization workshop, and Katie Pratt (DCO Communications Director, Engagement Team) clarified the process of scientific storytelling via short films crafted from video footage collected in the field. The Engagement Team also provided five GoPro video cameras and accessories for students’ use in Yellowstone, to allow the new videographers to practice their skills over the course of the week. At 6:00 a.m. the summer school participants and instructors dutifully assembled, collected their boxed meals, and loaded onto the bus for a day of exploration in Yellowstone. After entering through the west entrance, the bus pulled into Madison Junction, at the Yellowstone caldera margin. Here, Lisa Morgan continued her vibrant narration of the geology of the area she had begun on the journey from Big Sky. 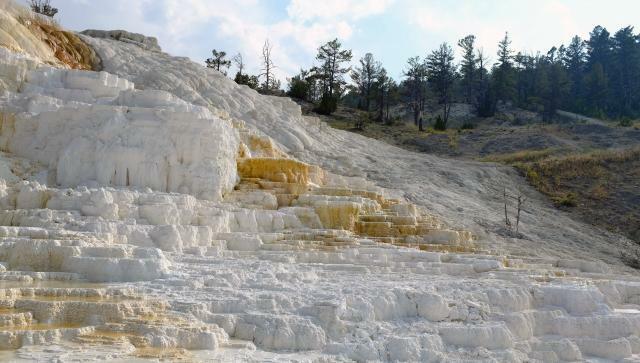 From Madison, the group headed to Midway Geyser Basin, home to Excelsior Geyser and the famous, rainbow-colored, Grand Prismatic Spring, where steam rises from hot springs in all directions. At Upper Geyser Basin the participants became so engrossed in the many different hydrothermal formations that they almost missed Old Faithful’s predictable eruption! But, having decided to stop here for lunch and hear Bill Inskeep provide greater detail on the local biogeochemistry, the group had another opportunity to watch the famous geyser blow. Dodging showers, the group spent the afternoon in West Thumb Geyser Basin, where Pat Shanks led discussion of the hydrothermal formations and spires on the bottom of Yellowstone Lake. And on the way out of the park, the group stopped at Tuff Cliff, where, at the base of a huge outcrop of Lava Creek Tuff, Lisa Morgan captivated her audience of Summer School participants with stories of the ups and downs of field volcanology. Day 3 of the DCO Summer School began with a lively follow-up discussion to the field trip. Adrian Jones kicked things off with some facts and figures about the Yellowstone volcano, surprising everyone with estimates for CO2 flux in the park. As one of the top ten CO2 emitters worldwide, Yellowstone degasses as much CO2 as the other nine combined. The instructors encouraged participants to consider the many factors that contribute to the unique geology and biology of Yellowstone. What is the contribution of geothermal heat? What about the unusual ratio of rhyolite to basalt in Yellowstone? What is going on in the Yellowstone magma chamber today? Dave Cole (Deep Energy Community co-Chair) described DCO’s Deep Energy Community goals, which include investigations into hydrocarbon generation through biotic and abiotic processes, the important serpentinization reaction, and attempts to understand the origins of life on Earth. He also emphasized the value of synthesizing field studies, experimental work, and theoretical calculations in order to tackle these questions in a truly cross-disciplinary manner. The early afternoon was devoted to Deep Life Community research, with John Baross wowing the group with his videos of hydrothermal vents at mid-ocean ridges. He also noted that Axial Seamount, a submarine volcano on the Juan de Fuca Ridge, will likely erupt at some point in the next two years, providing a unique monitoring opportunity both before and during eruption. Mitch Sogin (Deep Life Community co-Chair) then took the floor to describe the methods used to understand deep microbial ecosystem diversity and evolutionary relationships through next-generation sequencing approaches. At this point the diverse disciplinary expertise of the Summer School participants really began to shine through, and the session naturally and enjoyably transitioned into a group discussion. The day’s activities concluded with a session featuring poster presentations by all Summer School students. With connections already cemented after a day in the field, the poster conversations ran well over, continuing throughout dinner. The mood on the bus for the second field trip was cheerful and energetic, thanks in no small part to the wonderful field guides and their stories. After a quick visit to Beryl Spring, the group headed north to Norris Geyser Basin, a large expanse of hydrothermal features, mudpots, and springs. As the Summer School participants hiked around the basin Morgan, Shanks, and Inskeep all shared fascinating insights into geological and biological alterations happening in the area. From Norris, it was on to the northern edge of Yellowstone Lake. The largest high altitude lake in North America, it was mapped in detail by a USGS team led by the group’s guides, Lisa Morgan and Pat Shanks. Hiking along the northern shore of the lake provided plenty of opportunity for conversation, education, and some stone skipping practice with the abundant smooth, flat pebbles at the water’s edge. After Mud Volcano, the next stop was Mammoth Springs. Mammoth had not been on the original itinerary, but with some logistical changes, Martin the knowledgeable bus driver, and everyone’s willingness to extend the field trip into the evening, the group made it to this spectacular formation. The journey back to Big Sky was long, but spirits remained high as a result of the strong connections that had already been forged among Summer School participants and instructors. The morning of the final day opened with a review and discussion of the second day in the field, with questions and comments coming thick and fast from the participants. Marshall Ma of the Data Science Community re-capped the importance of the work going on at Rensselaer Polytechnic Institute to DCO, and talked about the practicalities of good data curation, analysis, and sharing. And after two enthusiastic days of filming, Katie Pratt re-emphasized the power of sharing science through video and social media. She also invited the participants to attend upcoming DCO Early Career Scientist sessions at the AGU Fall Meeting, and welcomed them as part of the ever-expanding DCO ECS Network. The afternoon session remained light hearted, with Adrian and John inviting general feedback and discussion about the Summer School, as well as the challenges and opportunities for deep carbon science over the next few years. 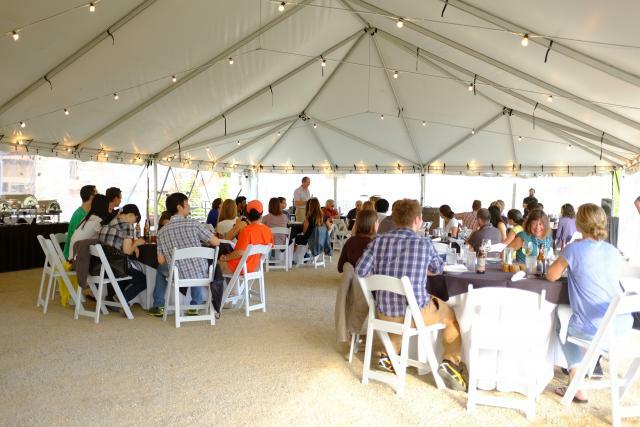 Over a final dinner at Big Sky, conversation centered on ways to continue to expand and grow the DCO Science Network, and where future workshops and summer schools should be hosted. In short, the first DCO Summer School was a huge success. Images: Katie Pratt and Yemerith Alpízar (FLIR group image). More photos can be found on Flickr and Facebook.